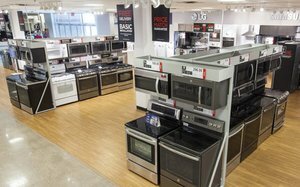 JC Penney is bailing out of the appliance business and radically scaling back its furniture sales. And while observers of the struggling retailer have every right to read the decision as one more example of a marketer in crisis—after all, it only chose to dive back into appliances a few years ago—they say it is a smart move. The decision also offers a clearer picture on what new CEO Jill Soltau has in store for the Plano, Texas-based retailer. She joined Penney back in October, leaving her role as president and CEO of Joann Stores. But the execution was poor, writes analyst Chuck Grom, who follows the company for Gordon Haskett Research Advisors, adding that it was only a matter of time before the company decided to reverse course. Americans spent about $91.74 billion on appliances last year, up from $63.8 billion in 2013, according to Euromonitor International. Department stores like JC Penney and Sears accounted for just 7.2% of unit sales, down from 8.9% in 2013. In its most recent quarterly results, Penney reported a $151 million loss, with comparable-store sales dropping 5.4%. Then last month, it said it would shutter three stores and announce additional closings at its next update. Its stock price even fell below $1 per share back in December. And while Gordon Haskett still rates JC Penney as a “hold,” he says the retreat on appliances is a good indication of Soltau’s intention to focus on apparel, including private labels, and soft goods as a way to boost the chain’s profits.